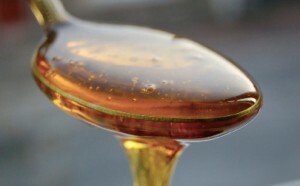 Organic Agave sweetener is a low glycemic natural liquid sweetener made from the extract of the blue agave plant. 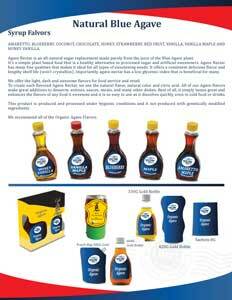 Compared to other sweeteners, our agave syrup is a much healthier choice due to its organic and natural origin. Being sweeter than sugar or honey, you can use less thus reduce your calorie intake. Agave is great for deserts, baked goods, sauces, and beverages. It is also ideal to use with heavier sauces such as barbecue and glazes for meats. It works well in hearty breakfast and desserts recipes and this particular grade is delicious in coffee, black and herbal teas. We offer our agave in Lite, Raw, Amber and Flavors. Available in bulk or packaged for Private Label. AMARETTO, MAPLE, BLUEBERRY, CHOCOLATE, COCONUT, HONEY, HONEY VANILLA, STRAWBERRY, RED FRUITS, VANILLA & VANILLA MAPLE. Our agave flavors are delicious and make a great topping for any type of dessert . This syrup is much lower on the glycemic index, so it won´t spike your blood sugar the way artificial or pure maple syrup can. We only use premium blue agave nectar to produce our flavors and it is organic and all natural..
With all of the flavored choices to choose from, there is plenty of opportunity for Food Service or Retail. Our Organic Agave Sugar can be used as a 100% natural sweetener and it is excellent for food, bakery and the beverage industry because of its elevated sweetener. 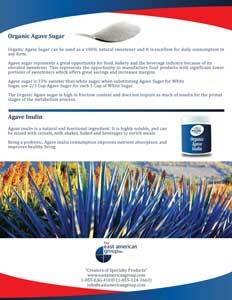 Agave Sugar is a great flavor booster and it enhances the taste of foods, beverages and bakery products. It is 33% sweeter than white sugar, this represents the opportunity to manufacture food products with significant lower portions of sweeteners which offers great savings and increases margins. Agave inulin is a natural and functional ingredient. It is highly soluble, and can be mixed with cereals, milk shakes, bakery and beverages. Being a probiotic, Agave inulin consumption improves nutrient absorption; and improves healthy living.